Close to 2,000 Filipino riders geared up for two days of thrilling bike action as Sunrise Events, Inc. in partnership with Cycle Asia and Bonifacio Global City (BGC), brings the third edition of the BGC CycleAsia Philippines. 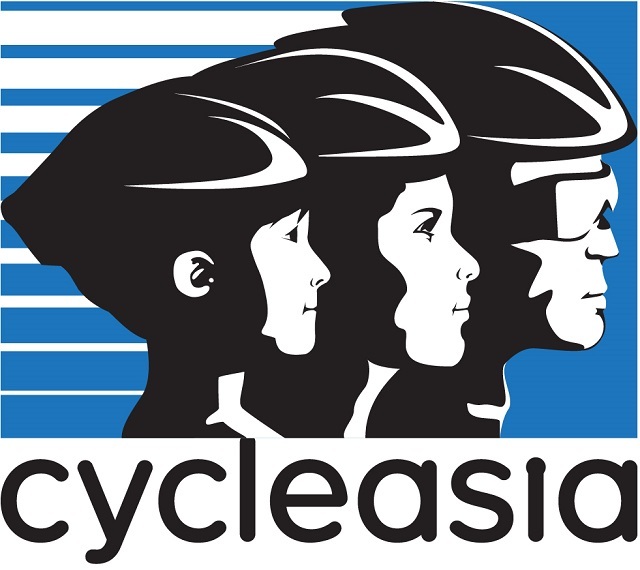 BGC CycleAsia Philippines, happened last November 20 to 22, 2015 at the Bonifacio Global City, is a part of Cycle Asia, a networkof premier cycling events across the region that offers participants the rare opportunity to ride on safe closed public roads in major Asian cities. “We at Sunrise Events, Inc. are very proud to be staging the BGC Cycle Asia Philippines for the third time this year. It is another one of the world-class sports event that we have in our yearly calendar and I am as usual glad to welcome back Spectrum Worldwide and BGC as our major partners for this event. Cycling as a sport and fitness activity has been growing tremendously in the country and we at Sunrise Events look forward to bringing a fun and awesome safe ride along the roads of Metro Manila to the cyclists, young and old alike.”, said Mr. Fred Uytengsu, CEO of organizer Sunrise Events Inc. The event catered to cyclists of all ages and abilities with The Tricycle Ride, The Kids’ Ride, The Community Ride (20km), The Challenge (40km) and the much-awaited Ride with Robbie (40km) categories. The Ride with Robbie category allowed Filipino riders the chance to ride with former yellow jersey wearer and three-time Tour de France Green Jersey Sprinters’ Classification winner, Australian Robbie McEwen, who will be here to join this event for the third straight time. “I’m both proud & excited to take part in the 2015 BGC CycleAsia Philippines. It’s my 3rd visit to the Philippines for the event & I’m looking forward to riding with everyone again on closed roads around BGC & Manila. Most of all I’m looking forward to the excitement of the kids’ rides. It’s always a highlight to see the kids’ excited & happy faces as they enjoy riding while being cheered on by their families. It’s going to be a fantastic weekend not to be missed!“, enthused McEwen who also happens to be the official Cycle Asia ambassador. Prior to the ride events, the entire family was kept entertained with a wide range of fun activities in the Cycling & Lifestyle Expo at the Ascott Bonifacio Global City Manila, the Official Residence of the BGC CycleAsia Philippines for 2016. The fun cycling action started in the morning of Saturday, November 21 via the kiddie ride categories starting with the 30-minute Junior Challenge ride and followed by The Kid’s Ride and Tricycle Ride categories. This day will be a truly fun bonding experience for kids and their family. On Sunday, November 22, was the Adult Ride categories. The event kicked-off by the Ride with Robbie with Australian former PRO cyclist Robbie McEwen and was followed by the 40km Challenge Ride and the 20km Community and Foldies Community Rides. Aside from the cycling action in BGC CycleAsia Philippines, Bonifacio Global City offered a wide range of activities for tourists to take advantage of during their stay. The district is well known for its open-air lifestyle retail and dining concept and public art program, as well as a world-class science museum and parks. Davaoeños Sonny Wagdos and Judelyn Miranda grabbed the top spots of the 21K centrepiece event at the National MILO Marathon qualifying leg in Davao City on Sunday. The city known as the Crown Jewel of Mindanao saw about 8,500 runners grace the running routes in the biggest and grandest running event in the country. Reigning MILO Marathon King Rafael Poliquit, who is already automatically qualified for the finals having won the 2014 MILO Marathon tilt, also gave his legs a stretch out in the Davao race. Wagdos and Miranda each took home the top prize of P10,000 in cash and a trophy; and earned their slots to the National MILO Marathon Finals. 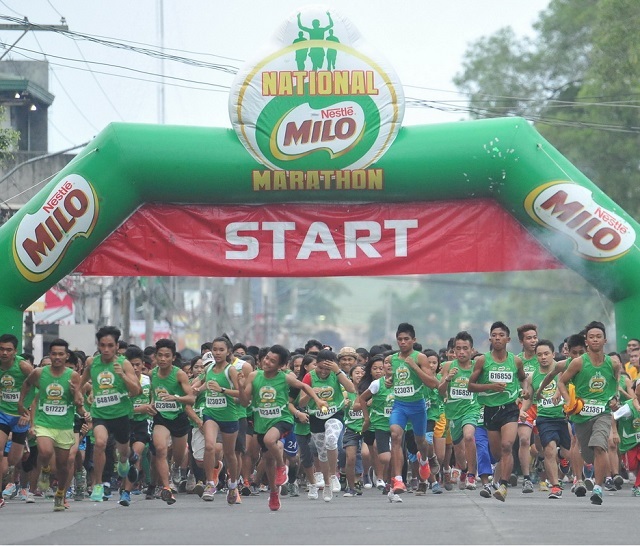 The finals will be held in Angeles on December 6, where they will meet the nation’s elite runners in a heated grand finale to claim the MILO Marathon King and Queen titles. To provide another level of prestige to the competition and incentive for the runners, this year’s King and Queen will be sent by MILO to the USA on all-expense paid trips, for a chance to run in the prestigious 2016 Boston Marathon. Despite the challenging new race route, Wagdos excelled in his category as he posted a time of 01:15:25, beating his rivals Michale Achalico (01:15:56) and Manny Marfil (01:19:34) who finished in second and third place, respectively. In the distaff side, Miranda clinched first place with a time of 01:32:57, relegating Madelyn Carter (01:48:19) to second place and Hazelvic Villanueva (01:52:07) in third place. This race is Wagdos’ second championship crown in Davao. The 21-year-old 4th year student of Univeristy of Mindanao has been running since he was in elementary. “I got into running because I really wanted to study and finish a degree. I was able to get scholarships because of my passion,” he shared. “I always have to focus on academics so I’m not always 100% in training. This year’s race route is also quite difficult because of the uphill parts. Fortunately, I still won the race. I’m so happy. The new spot, created by award-winning agency Droga5 and entitled “Flash,” illuminates Curry’s unparalleled skill set, which continues to transform the game of basketball. Foxx provides a narrative that questions, “How long does it take to change the game of basketball?” The emphatic response is, “.4 seconds,” which is the amount of time it takes for Curry to release a shot, the fastest ever measured. Amidst explosions of light, sparks and smoke, Curry unleashes an array of moves in an explosive sequence, as Foxx narrates his journey to the top and his lasting effect on the sport. The spot features the “Iron Sharpens Iron” Curry Two, the lead colourway of Stephen’s second signature shoe. 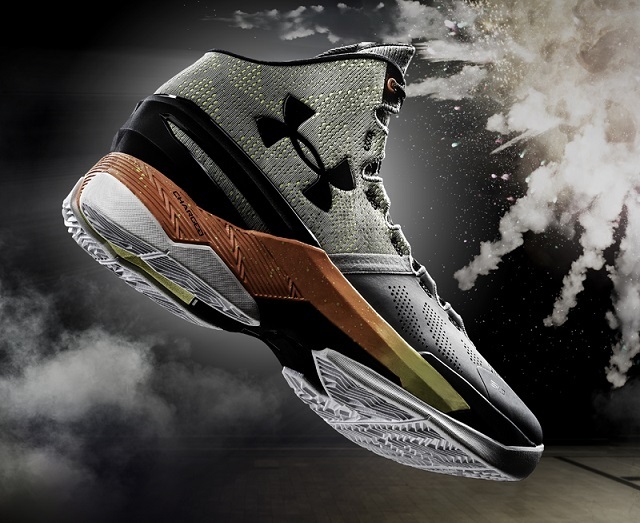 Inspired by Stephen’s relentless commitment and dedication to make his teammates better through his play and leadership, the “Iron Sharpens Iron” Curry Two features a grey upper with a back layer of yellow that pops through perforated patterning, as well as a midsole with orange to yellow fade that incorporates detailed speckles to represent the forging of metal. Stephen’s motto, “Make My Teammates Better,” serves as the foundation for how Stephen mentally approaches the game of basketball. His strength and fortitude serves as a source of strength for his teammates and the team.Additional colourways of the Curry Two will release throughout the season. The “Iron Sharpens Iron” Curry Two will retail at Php8,995.00 at the Under Armour Bonifacio High Street, SM Megamall and UP Town centre, and selected multi-branded stores of Tobys, Titan, Olympic Village and Planet Sports. Eight additional colour ways will be released over the rest of the quarter, up till Christmas. The world’s number one sports drink is finally making its debut in the country’s fast growing running circuit with the launch of the first ever Gatorade Run. The run will happen on November 22 at the Seaside Boulevard at the SM Mall of Asia in Pasay City. There will be two distances—11 and 22 kilometers gun-starting at 5:00 and 4:00 AM respectively. Race fee is P1,100 for 11K participants and P1,500 for their 22K counterparts. The pre-race kit will include an Adidas race tee, a race bib and a timing chip. Another Adidas shirt, this time a finishers tee, will also await all finishers. The Gatorade Run will feature a hydration station where participants can get pre-race hydration drinks, a post-run hydration test area where they can instantly learn about their hydration status, and a warm-up area where free sessions will be available for those who want a full-on warm up activity before the run. Online registration is until November 13. Runners can also troop to Adidas outlets at Trinoma, Bonifacio Global City, Greenbelt 3, SM MOA and SM Megamall to register until November 8. Registered participants can start claiming their kits on November 16 until November 19 from 12:00 NN to 8:00 PM at their chosen store and schedule upon registration. 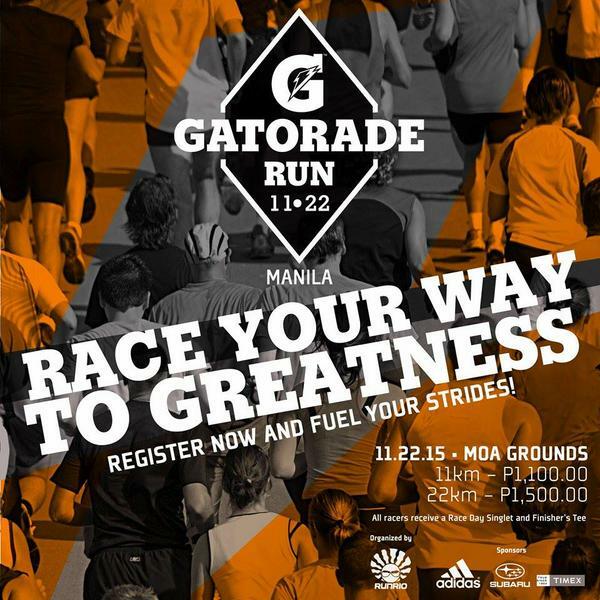 Log on to runrio.com/gatorade-run-1122 for more information or to register. Reigning MILO Marathon Queen and SEA Games medalist Mary Joy Tabal and MILO Marathon veteran Juneil Languido breezed through the running routes at the National MILO Marathon qualifying leg in General Santos on Sunday. 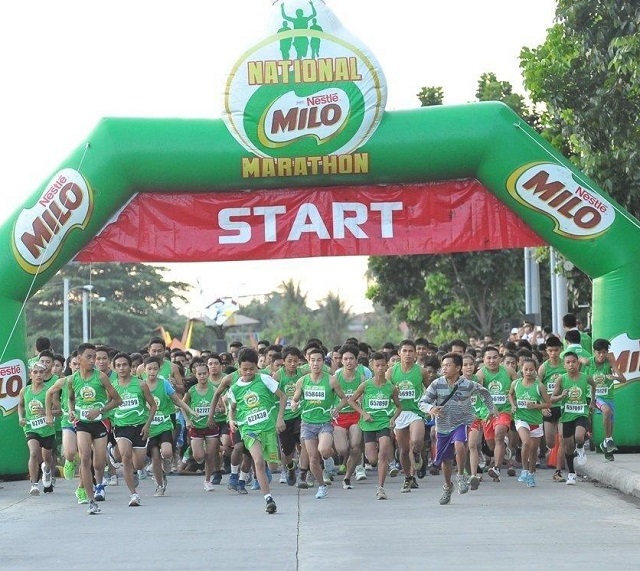 About 9,000 runners joined the race, making this year’s MILO Marathon the biggest fun run in General Santos, to date. Languido and Tabal each took home the top prize of P10,000 in cash and a trophy; and earned their slots to the National MILO Marathon Finals. 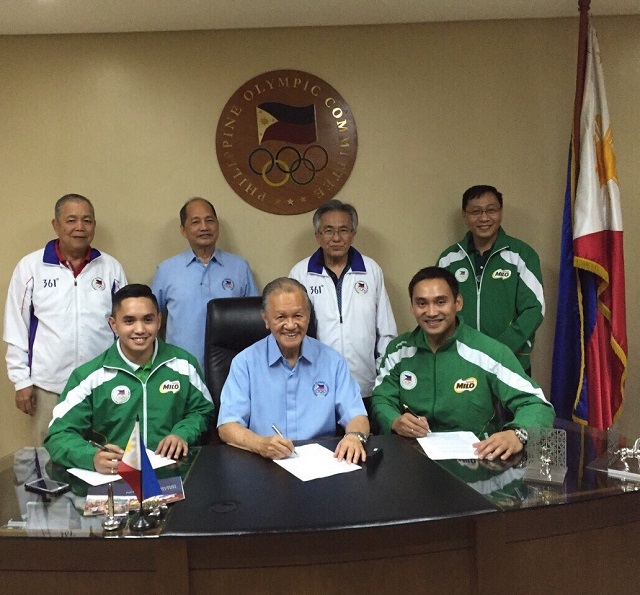 The finals will be held in Angeles on December 6, where they will meet the nation’s elite runners in a heated grand finale to claim the MILO Marathon King and Queen titles. To provide another level of prestige to the competition and incentive for the runners, this year’s King and Queen will be sent by MILO to the USA on all-expense paid trips, for a chance to run in the prestigious 2016 Boston Marathon. Languido posted a time of 01:14:04, overcoming his rivals Elmer Bartolo (01:16:47) and Gilbert Maluyo (01:20:42) who finished in second and third place, respectively. In the distaff side, Tabal ruled with a time of 01:21:42, relegating Mona Liza Ambasa (01:35:03) to second place and Noemu Andrea Galeos (01:52:44) in third. Noel Tillor and Ruffa Sorongon share the spotlight in the Cebu leg of the 39th National MILO Marathon held on Sunday. The pair captured the top spots in the 21K centerpiece events, amid tough competition. Over 24,000 runners took to the roads in the Queen City of the South. Having won the best organized leg award for three years straight, the Cebu organizers, led by Ricky Ballesteros, delivered its promise of a world class running event. Disco music was blasted, and festival dancers were stationed at strategic points to help motivate the runners. The Cebuanos worked hard to showcase their rich history, culture and hospitality, and create a festive atmosphere, making the Cebu race an unforgettable one. Tillor led the pack with a time of 01:14:46, relegating Narceso Deterala (01:16:36) to second, and Adonis Singson (01:17:29) to third. In the distaff side, Sorongon bested her rivals with a time of 01:29:05. Miscelle Gilbuena (01:32:04) and Lizane Abella (01:42:58) complete the female division’s top three, finishing second and third, respectively. Comendador and Ramirez each took home the top prize of P10,000 in cash and a trophy; and earned their slots to the National MILO Marathon Finals. The finals will be held in Angeles on December 6, where they will meet the nation’s elite runners in a heated grand finale to claim the MILO Marathon King and Queen titles. To provide another level of prestige to the competition and incentive for the runners, this year’s King and Queen will be sent by MILO to the USA on all-expense paid trips, for a chance to run in the prestigious 2016 Boston Marathon. The reigning MILO Marathon Queen and SEA Games silver medalist, Cebuana Mary Joy Tabal, was also present at the race, together with her coach John Philip Dueñas. The running duo has been coaching 47 students under the grassroots sports program of the Cebu City Sports Commission. The 47 kids are recipients of MILO’s Help Give Shoes advocacy. With the support of the Department of Education and the National MILO Marathon runners, MILO was able to provide these children with brand new running shoes, which they have already put to good use as they joined Sunday’s race. After teaching running basics for four months, the hard work of the running duo has truly paid off as one of their beneficiaries, Jessel Ochia made a herculean feat as the champion of the girls’ 3K category with the time of 00:11:55. Two boys from the same race category, Carl Jhon Beboso (00:11:42) and Juvan Yongco (00:11:49) also made remarkable rookie performances as third and fifth placers, respectively. This year, the Help Gives Shoes advocacy will provide 10,000 underprivileged youth with brand new running shoes this year. MILO is working with DepEd in the selection of deserving public school student beneficiaries.